In early September Nike launched their latest “Just Do It” campaign, created by agency Wieden & Kennedy. The new ads were textbook Nike; embracing the sportswear company’s habit of celebrating rebels and pushing the limits. One brand tracking company estimated that 50 percent of U.S. consumers (over 18) saw the Nike ad in the first two weeks after its launch. 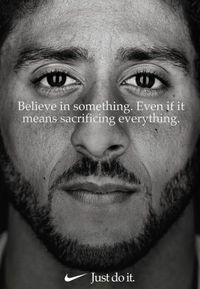 In case you’ve been living under a rock, the ad featured Colin Kaepernick, the former NFL quarterback, who started the protest movement in 2016 against racism and police brutality by kneeling during the pre-game national anthem. The campaign’s copy which reads, “Believe in something. Even if it means sacrificing everything,” alludes to the fact that Kaepernick has not been able to sign with an NFL team since he began the protests. Initially, the response to the campaign seemed to be negative. Nike’s stock price dropped by 3.2 percent, which was the biggest one-day drop since April. Social media backlash lit up screens with video posts of people burning their Nike shoes and cutting the famous swoosh logo off their clothing. By mid-September, a new story was emerging. Nike’s stock price had hit an all-time high of $83.47 per share. Tracking of retail sales showed that Nike merchandise purchases were up by over 20 percent, compared with 2017 figures. The company added 170,000 new Instagram followers. In addition, Nike garnered over $43 million in unpaid media exposure related to the Kaepernick campaign. One research company tallied the media coverage that was generated and categorized whether it was negative, positive or neutral. Over $32 million of the coverage was either positive or neutral. of them taking a knee during the anthem. A closer examination of the numbers shows a huge age gap. With people ages 18-34, 67 percent of them approved of the protest. Of those 65 and older, 46 percent did not approve. In analyzing the failure or success of Nike’s campaign, it’s critical to remember who their core customer is. And it is not conservative, white, 65 year olds. Nike understands that two thirds of their customers are under age 35. The campaign resonated with these category influencers, who drive the brand awareness. Another thing to keep in mind is that Nike is a global brand, with huge sales outside the U.S., where consumers are invariably less emotional about our national anthem.